Surprised this hasn't been reviewed yet oh well here goes. Now onto the second vehicle of this set. Harley Quinn's truck to start of is rather wide and a pretty decent truck. It's more of a hummer made monster truck type of deal. Assembly is rather simple. There are a few technic pieces thrown in but they are hardly noticeable when fully assembled. Building this set is straightforward. 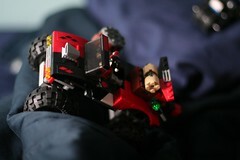 There is a slight repetition in one or two of the instructions for the top body frame parts and for the tire assembly. It's nothing boring though. The main color scheme of this set is an alternating black and red deco that looks very nice. 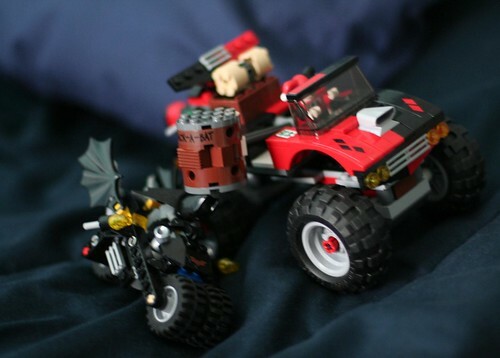 This vehicle like the Batcycle does feature flick fire missiles (which again don't fire very far) at the back of the truck. The main weapon though for Quinn's truck as the name would suggest is a large hammer. It's decent looking hammer that's mostly brown. A very nice detail is the sticker you apply to the actual hammer which says "Whack a Bat". A very nice little humurous detail much like the "push" button sticker located near Harley whilst she drives. The hammer is pretty fun to play with. It is attached to the main truck by way of a long technic rod that attaches to another technic rod which feeds to the back where round bricks act as the knob to turn. 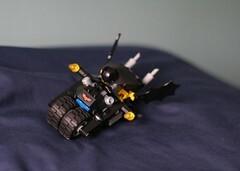 It has the ability thanks to this to whack obligatory objects or chasing Batman's on either side of the truck. Only problem is the hammer is very limited into how far away it can whack something. The reach is only about an inch away from the tires. This can easily be fixed though with a few additional parts. Overall this set is quite nice. It has great play value thanks to Ms. Quinn's truck. This set retails at $34.99, but you can easily get it for $26 and under if you look around. Minifigs:10 /10 This set includes the much anticipated Harley Quinn figure as well as a Batman with a new styled suit. Playability:10 /10 Quite fun to play with, kids will have a lot of fun whacking Batman on the head. Price to parts: 8/10 Nothing too special with this set since it's mostly basic parts with a few newer elements. Price to part is still decent. Availability:10 /10 This set is available at many retail outlets. Hey, great review of the set. I'm really hoping to get this for my birthday, but all the stores I've called here in Singapore say the set is "discontinued". Where might I find it, even online? 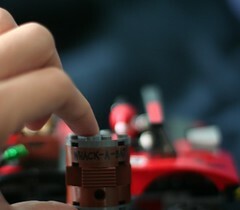 Jedd- try bricklink.com they have all kinds of sets on there. Batman sets are very hard to find nowadays. Anyways the review was great and has me wishing I got this set. Yeah I'd say bricklink is your best bet. I just checked amazon and cheapest they go is about $90 US. Whereas on BL you can get a new one for about $43 US and up. You could try and wait it out and see if S&H re-stocks, but it's hard to say so soon after the holidays.